On a recent episode of Wife Swap, a political talk show host and Tea Party activist named Gina Loudon traded lives with Angela Envy, a woman in a polyamorous relationship. As you might imagine, the fur flew. Usually "Wife Swap" ends with the two families sitting at a roundtable to discuss the experience. But ABC made a big thing in its publicity that this was the first time in the show's history (it's now in Season 7) when one family refused to met and discuss. Which chickened out? The Loudons. A narrator says that John and Gina's attorney informed the show that they would no longer participate in any way. So, we are left with the triad and their kids at the roundtable alone, discussing how awfully things went, how disrespectful and judgmental the politico-religious couple were, and how utterly overjoyed they all are to be back together safe again in their own happy home.
. . . My assessment: The show displayed Religious Right evangelicals being their worst. No viewer can have missed this. The poly family came off as trashy at first, but became much more sympathetic during the ordeal as they pulled together and stuck up for each other at every turn. The happy ending was lopsidedly pro-poly. Read the entirety of Alan's review. 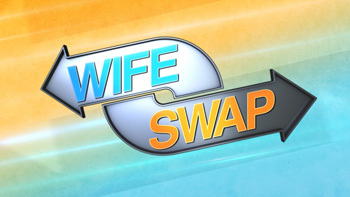 And if you'd like, watch the full Wife Swap episode on ABC's site. The episode was also a topic of discussion on a recent episode of the Poly Weekly podcast.